18 things about black Crows that you might not of known! Crows are very vocal birds. They are sly and often deceptive in their actions. Crows have been known to build false nests high in treetops to confuse predators. The height of their nests give them the opportunity to watch everything that is going on around them. 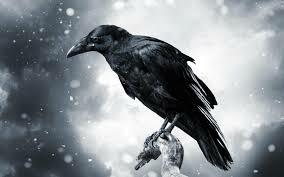 Many cultures think of crow as the keeper of knowledge for nothing escapes their keen sight. Each caw has its own meaning.The striking black color of crow represents the color of creation.Crow is associated with magic, unseen forces and spiritual strength. If crow flies into your life, get out of your familiar nest, look beyond your present range of vision, listen to its caw and act accordingly. Take heed.